NEW BYO PARTY CRUISE TWO!!! Get on board the Spirit Of Wollumbin for the second Nautickle Beats floating, sunset house party. Six hours of beats and great local DJs. $50 ticket price includes transfer and cruise. BYO. 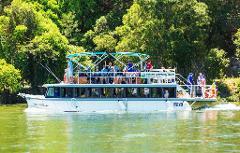 Join us for a stunning three hour cruise on the Tweed River, and catch the sun set over majestic Mt Warning. The Cloudcatcher Sunset Wood Fired Pizza Cruise will include delicious woodfired pizzas, embracing local Tweed produce.